Divided among themselves and persecuted by Muslims, churches succeed in obtaining Islamic help. King Abdullah II of Jordan plans to restore the supposed site of Jesus’ Tomb in the Church of the Holy Sepulchre in Jerusalem, at his own personal expense. Abdullah recently issued a makruma, or Royal Benefaction, to this effect. It was reported earlier this month that the Greek Orthodox, Armenian Orthodox and Roman Catholic Churches would each pay a third of the $3.4 million cost. Work on repairing the shrine is to begin in several weeks' time. The monument, the present form of which dates back to 1810, is to be completely rebuilt. 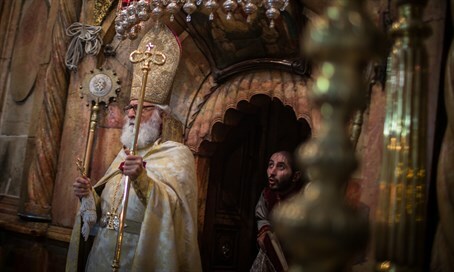 The marble slabs will be taken off, the 12th-century Crusader shrine beneath will be repaired, and the cracks in the rock-hewn tomb under that – where many Christians believe Jesus, son of a Jew from Bethlehem named Joseph, was buried – will be filled. The head of the Jerusalem Greek Orthodox Patriarchate, Theophilos III thanked King Abdullah and lavishly praised his generosity. The Patriarch said, for instance, that the king "has always been, and shall remain, the faithful Guardian and Custodian of the Christian and Muslim Holy Sites in Jerusalem." Theophilos, whose official title is Patriarch of the Holy City of Jerusalem and All Palestine and Jordan, also said that Abdullah "embodies in deed, and not only in word, the shared living of Muslims and Christians all over the world and particularly in the Holy Land." Such remarks ring hollow among many Christian communities in Islamic countries, where Christians are severely persecuted. In Pakistan last week, for one example out of many, a suicide bomber detonated himself amidst an Easter service, killing at least 70 people. A Taliban faction claimed responsibility and said the attack was "aimed at killing members of Pakistan's Christian minority gathered at the park to celebrate Easter Sunday." Christiantoday.com reports that though the renovation in Jerusalem will be technically challenging, "a far greater challenge was getting agreement over the need for the work." Responsibility for the Holy Sepulchre has been divided among six Churches since 1853. It took them 17 years of debate, ending in 1995, to come to an agreement on painting a section of the central dome. Even more extreme is the case of the wood ladder propped up against one of the exterior windows of the church. It has not been moved since at least 1757, because the various Churches have not yet agreed on whose responsibility it is to move it. Some disputes have also led to fistfights. The church in question is located in the center of the Christian Quarter of the Old City, not far from Jaffa Gate.